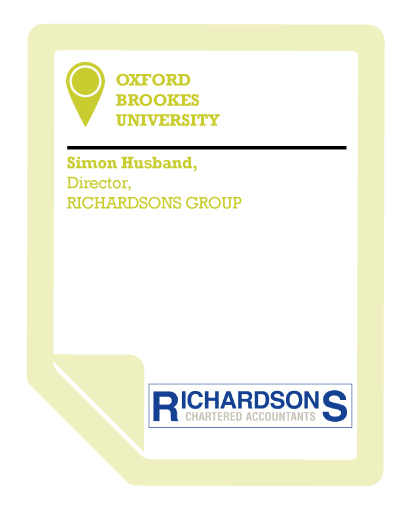 The Richardson’s Group are chartered accountants and business advisers. We’re about 40 people and we’re a training firm, so at any one time there will be 10-15 trainees who are training to become chartered accountants. We’re steeped in training and development. We live and breathe it. It’s very useful to have a lot of fresh young minds who can contribute. Typically a firm of our size would have 2-3 trainees rather than more than 10. We get a lot of benefit from training, a lot of our quality people are people we have trained ourselves and a lot of useful input comes from quality people we have trained here. Our relationship with Oxford Brookes University has evolved over time. The University is geographically very near to us. We had some very high quality people who applied and joined us who were graduates of Brookes. We have also used some of the University’s business services on things like coaching and mentoring. We are even working with a couple of businesses that are spinning out of Brookes. It’s a connection on so many levels. Last year I got accosted by the president of Brookes Entrepreneurs, a student body to provide support to students to think entrepreneurially. We work with a few universities, at various levels, but nothing like as strong as the Brookes connection. Oxford Brookes University has sent us some really high quality graduates to train as accountants. The Business School at Brookes is very high quality, there is no doubt about it. Having a strong connection with Brookes means we have a more prominent presence in the community in which we operate. We currently have someone working with us in her first year of training who we recruited while she was still in her penultimate year of study and agreed that she would join us when she graduated. It was a nice moment when she got a first and came top of the entire year and a few weeks later she was in our office showing us just how brilliant she is. We’re always pleasantly surprised at how nice the people are at Brookes are, how much effort they make to be conscious of, and in communication with, the business environment. So many academic institutions have a reputation for being very “ivory tower”. They don’t want to get down and dirty with the tradesmen, but Brookes doesn’t have that reputation, they’re very good. If you haven’t got the time to do it, it’s not worth it and you won’t benefit from it. But these things are worth investing time in. It’s not just about the pipeline of talent, although I have to say if we could clone our recent Oxford Brookes graduate we would do it without hesitation. But it’s not just that, it’s also the other things you get from the university. For example, we try to do interesting, non-technical training for our managers every year. The year we used Brookes to do this training is probably the best we’ve ever had. There is a lot of benefit for the business in that kind of thing.